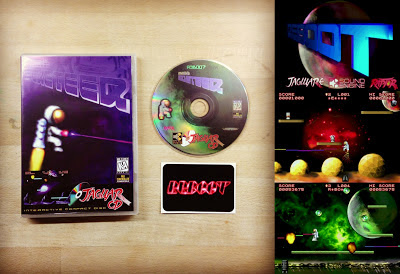 Following the Jaguar CD releases Kobayashi Maru: Final and Jagware Collection 1.0, Reboot and RGCD are back with another serving of unashamedly old-school arcade goodness in the form of Full Circle: Rocketeer. Rebuild and reload your crashed space craft whilst fending off endless waves of hostile aliens and meteors in 16 unique levels spread over 4 worlds! Full Circle: Rocketeer features 50/60 FPS fluid gameplay (PAL/NTSC) powered by Reboot's Raptor game engine, 8 channel digital sound (music and effects), collectable bonus items, online high scores (via webcodes), MemoryTrack saving and ProPad controller support. Priced at £21 (plus £4 UK/Europe shipping, £5 rest of world) Full Circle: Rocketeer is available to buy from our shop page today!